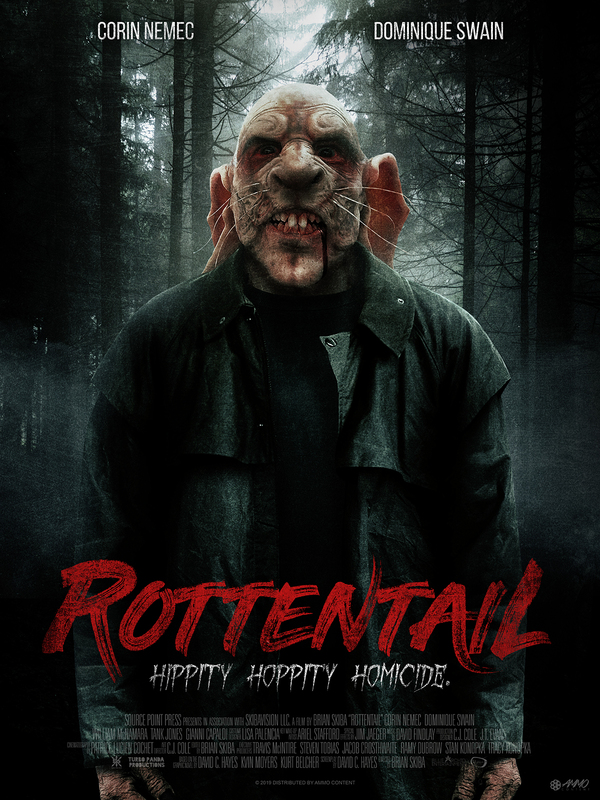 Synopsis: “Rottentail” tells the bizarre tale of Peter Cotton, a scientist that works on rabbits and infertility. Cotton finds out that the military wants to use his work to create soldiers with superhuman strength and he tries to avoid it. In an accident, he is bitten by an experimental mutant rabbit a, after it mixes with the serum he has been working with, he turns into the evil Rottentail. In the film’s world, there are movies that care about having a deep and captivating story, impeccable acting, and memorable production. Other movies only aim at being entertaining and that the viewer has a good time. “Rottentail” falls in the latter category. This type of movies thrive on being absurd just to be entertaining, embracing their limitations and using then in their favor. “Rottentail” starts in a silly tone, presenting the protagonist, Petter Cotton, interpreted by Corin Nemec (“Sand Sharks”). Cotton is presented as the stereotypical nerd that since his childhood has suffered from bullying because of his intelligence and his weird passion for rabbits. This remains unchanged in his adult life, and it is clear that nobody in his job respects him. Quickly we can see that the acting by Nemec is over the top and absurd, but that it works well with the tone of the movie. Once Cotton is bitten by a mutant rabbit, he starts transforming into Rottentail. While his transformation is underway, he is contacted by an old acquaintance Ana, interpreted by Dominique Swain (“Blood Craft”), who asks for his help to stop the plans of Jake Mulligan, interpreted by William McNamara (“Copycat”), one of the persons responsible for the abuses Cotton suffered as a child and that now is a fraudulent pastor. 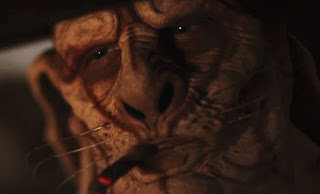 As soon as the transformation from Cotton to Rottentail we see that one of the most important changes, besides the obvious physical changes, is in his personality. Rottentail is the complete opposite of Cotton. Since this part on, the movie turns even more absurd and exaggerated and one-liners start to be overused, even when not all of them land properly. We also see that director Brian Skiba (“Dirty Little Trick”) was not shy about gore, for what there is plenty. This movie is based on a graphic novel of the same name created by Kurt Belcher. The influence of the graphic novel style can be seen from the start, with saturated colors and exaggerated and flashy characters. It also has some influence on horror movies from the 80’s decade, crafting an atmosphere inspired in movies from this period. The most prominent part of the technical aspect was the score. Each track is great, some inspired in the style of music usually found in cartoons, as well as in 80’s horror movies. If you decide to give “Rottentail” a chance, do not expect anything sophisticated. It is a movie with an absurd and over the top screenplay along with the acting, but this serves the higher purpose of being plenty fun. From this perspective, it has the potential to garner a cult following from people that enjoy these kinds of campy themed horror comedies. Also, the underlying topic of the fight between an Easter bunny and a figure, that although corrupted, represents Christian religion is interesting in this type of setting. 10th Circle is a webpage dedicated to reviewing horror movies and related genres. We make an effort to give our most honest and unbiased opinion for every movie we review doing our best to remain as spoiler-free as possible.